I read The Book Thief soon after when it was first published, but I decided to reread it this year as there is a movie coming out in spring. As all my reading recently, it went slowly, but I thoroughly enjoyed rereading this jewel among WW II stories. What makes The Book Thief stand out from other books in the genre is its greatest strength – or vice, depends on whom you ask – that is, its narrator and writing style. 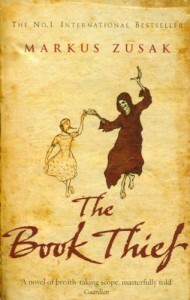 The Book Thief is narrated by Death, which results in a unique writing style with little lists, narrator’s notes and digressions from the main story. Whereas I can easily understand this can make it hard for some people to get into the story, I loved this style in this particular book. The language is beautiful, and there are so many truths said about history, life and human race in general, put in such an elaborate manner that it is hard to pick just a few favourite quotes from it. Zusak captured Death in a way that I believe could fit her perfectly. Yes, I wrote her, because in Slovene tradition Death is a female, an old lady with a scythe, and Death’s personality as depicted in the book fits my preconception of Death as such so well that I subconsciously went along with it, despite being aware of Death being a man in Germanic culture, and I was from time to time surprised by the reminders that Death is actually supposed to be male. As for the main protagonist, Liesel, her story is full of tragedy, but also hope, happiness, and, of course, mischief. 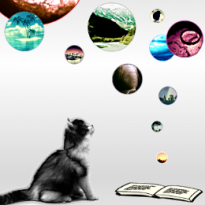 It is a story of growing up in a difficult era, and is as such both beautiful and sad, suspenseful and funny. I could say a lot about how it touched me and which parts I especially enjoyed or found important, but I don’t wont to spoil the book for you, so I won’t. Other characters are portrayed just as vividly and diversely as Liesel, which adds to the richness of The Book Thief's world. There are numerous characters worthy of mention, from Rudy to various townspeople, though the ones that had the most impact one her life were her foster parents, who, with their opposing personalities, provided Liesel with exactly what she needed and gave her a family. Rosa, with her yelling and raw exterior and a heart of gold inside reminded me very much of my grandmother, which always makes me like a character. Even though The Book Thief is by some standards a YA book, I would be cautious when categorising it as such due to its themes and the way they are conveyed, for Zusak doesn’t spare the reader with both physical and emotional suffering and the allusions, sometimes quite direct, even graphic, to the atrocities of the era and the mechanics of the war itself. All in all, however, The Book Thief, is an exceptional novel, which could be enjoyed by people of different ages (perhaps, apart from young teens), depending on the individual, naturally. RECOMMENDATION: If you like historical fiction, especially WW II novels, and you are open to a somewhat unusual approach, The Book Thief might be a great book for you.